I was inspired to make this pizza after visiting Austin, Texas last year and eating dinner at a place called Second Bar and Kitchen on Congress Avenue. I fell in love with the combination of flavors. This pizza is a savory rich pizza. 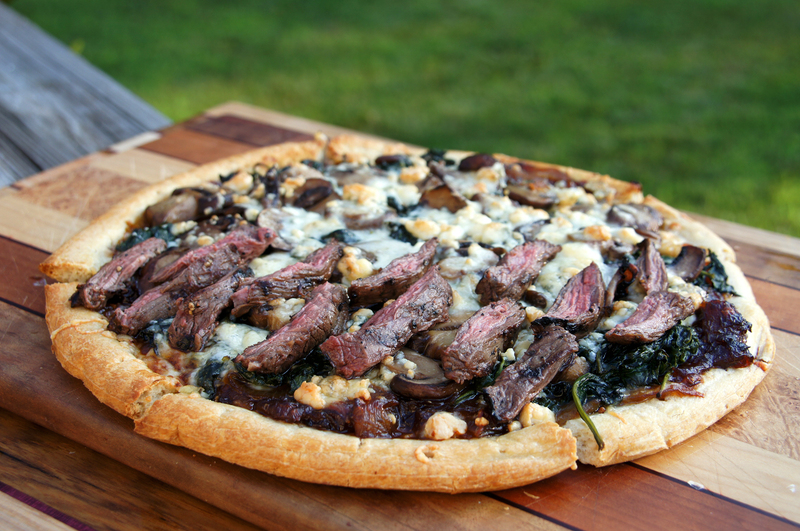 It combines sweet caramelized onions, sauteed mushrooms and spinach, Gorgonzola or Blue cheese and grilled skirt steak. (or in this case only 1/2 of the pizza has steak due to the demands of my household!) I generally make this pizza when I make my caramelized onion and 4 cheese pizza since I am already caramelizing onions. Homemade or store bought pizza dough or I love to use Mama Mary’s Ready Made Pizza Crusts for a quick fix! Skirt steak seasoned with salt and pepper to taste. Caramelize the onions (see how here in my caramelized onion pizza recipe) and set them aside. Preheat the oven to 400. Put your pizza stone or pan in the oven at this time too. Heat olive oil in a large pan over medium heat. Add mushrooms and cook until soft and lightly browned. Set them aside. spread the caramelized onions on to the crust, followed by the spinach, mushrooms and cheese. Place your pizza on your preheated stone or pan and bake for 10 to 15 minutes depending on the crust/dough you use. While you are baking the pizza grill your skirt steak to your liking, let it rest slightly and slice. 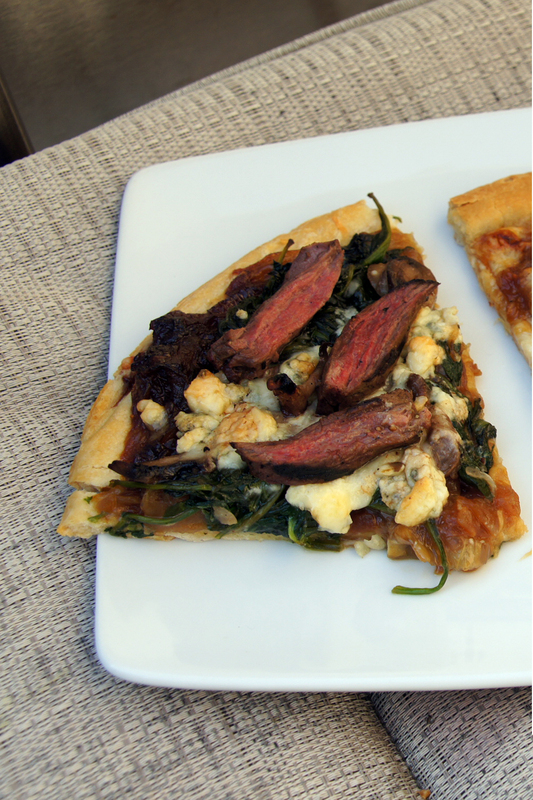 Remove pizza from oven and top with sliced skirt steak. Yum! Wish I had tried this on my trip to Austin a few months ago. Instead we only had cocktails (and a lot of them!) at Congress Bar. The kitchen had just closed so we were out of luck on food. I’m going to have to try making this very soon to make up for it! It is so yummy! Try it and let me know! This Pizza looks so yummmm!